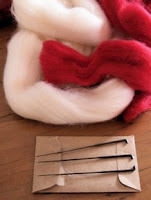 Recently I attended a craft fair and was intrigued as I watched a felt artist stab away at a bundle of wool. She was working on a doll in the shape of an old woman. The detail that she was able to achieve was incredible. I remember falling in love with a Santa that she had on display and vowed that I must give this needle felting thing a try. So as July approached I decided that this year's Christmas in July project should be my very own felted Santa. 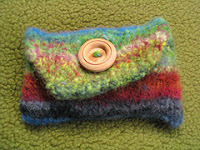 I purchased some wool and a felting needle and made a start one night amongst my sewing group friends. They laughed as they watched me. Teasing that I looked like I was practicing voodoo as I stabbed away at my Santa. But I persisted and within an hour my very own Santa emerged. I have included a photo of him for you. The process is very simple although I did manage to stab myself quite regularly. 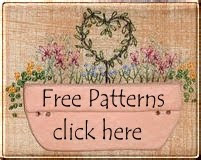 I have included some other photos of felted projects from flickr in the hope that I can inspire you to try this technique. 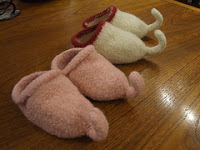 There's everything from felted purse pictures to felted birds. 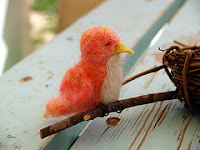 I also came across some videos on youtube that show how the needle felting process. 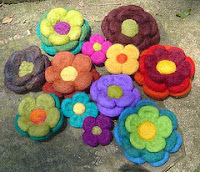 Just go to www.youtube .com and search for felting. 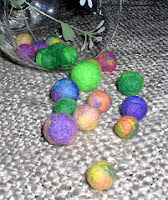 Until next time, happy felting!